The brilliance of Laurence Juber’s approach to solo guitar arranging is perhaps best witnessed on his multi-album survey of the Beatles songbook: LJ Plays the Beatles! (2000), LJ Plays the Beatles, Vol. 2 (2010), and LJ Can’t Stop Playing the Beatles! (2017). From the most recent volume, “Day Tripper” finds Juber putting his own imprint on this 1965 single, with its famous electric guitar riff. Although the original version of “Day Tripper” is in the key of E major, in standard tuning, Juber chose to arrange it in the key of D, in DADGAD. This allows him to play the roots of the I and V chords (D and A, respectively) on the open sixth and fifth strings, while accessing select melody notes on the open top strings. At the heart of the arrangement is an adaptation of the original guitar riff. Though Juber plays it with a little more finesse than the Beatles did—adding either a slide or hammer-on between the minor-to-major-third move (F to F#)—he maintains the proper spirit and unrelenting groove. This analysis of The Beatles’ “Day Tripper” originally appeared in Acoustic Guitar’s October 2018 issue. 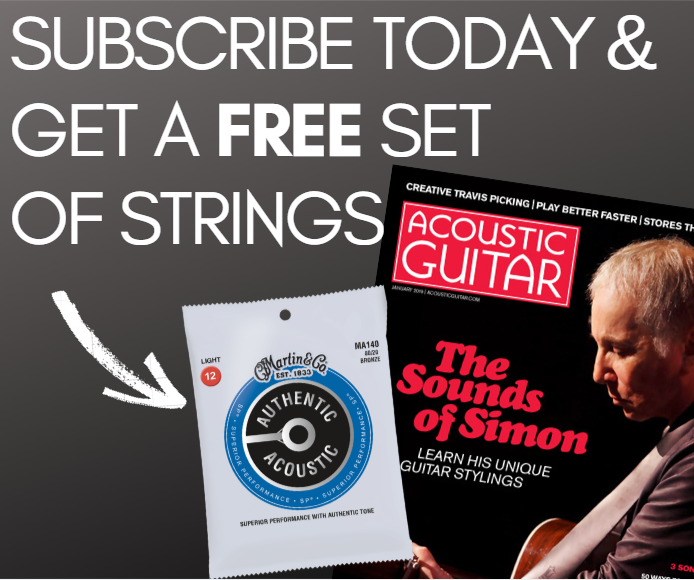 For the full article, including performance notes, and music notation and tab, head to the Acoustic Guitar Store and pick up a copy.